David indicates that our Lord Jesus Christ has no genealogy with regard to His divinity (Ps. 110:4), Isaiah says the same (Isa. 53:8), and later so does the apostle (Heb. 7:3). How can the descent be traced of Him "who is in the beginning, and is with God, and is God, and is the Word and Son of God" (cf. Jn. 1:1-2, 18)? He does not have a Father who was before Him, and shares with His Father "a name which is above every name" and all speech (Phil. 2:9). For the most part, genealogies are traced back through different surnames; but there is no surname for God (cf. Gen. 32:29), and whatever may be said of Father, Son and Holy Spirit, they are one and do not differ in any respect. Impossible to recount is Christ's descent according to His divinity, but His ancestry according to His human nature can be traced, since He who deigned to become Son of Man in order to save mankind was the offspring of men. And it is this genealogy of His that two of the evangelists, Matthew and Luke, recorded. But although Matthew, in the passage from his Gospel read today, begins with those born first, he makes no mention of anyone born before Abraham He traces the line down from Abraham until he reaches Joseph to whom, by divine dispensation, the Virgin Mother of God was betrothed (Matt. 1:1-16), being of the same tribe and homeland as him, that her own stock may be shown from this to be in no way inferior. Luke, by contrast, begins not with the earliest forebears but the most recent, and working his way back from Joseph the Betrothed, does not stop at Abraham, nor, having included Abraham's predecessors, does he end with Adam, but lists God among Christ's human forebears (Lk. 3:23-38); wishing to show, in my opinion, that from the beginning man was not just a creation of God, but also a son in the Spirit, which was given to him at the same time as his soul, through God's quickening breath (Gen. 2:7). It was granted to him as a pledge that, if, waiting patiently for it, he kept the commandment, he would be able to share through the same Spirit in a more perfect union with God, by which he would live forever with Him and obtain immortality. By heeding the evil counsel of the pernicious angel, man transgressed the divine commandments, was shown to be unworthy, forfeited the pledge, and interrupted God's plan. God's grace, however, is unalterable and His purpose cannot prove false, so some of man's offspring were chosen, that, from among many, a suitable receptacle for this divine adoption and grace might be found, who would serve God's will perfectly, and would be revealed as a vessel worthy to unite divine and human nature in one person, not just exalting our nature, but restoring the human race. The holy Maid and Virgin Mother of God was this vessel, so she was proclaimed by the Archangel Gabriel as full of grace (Lk. 1:28), being the chosen one among the chosen, blameless, undefiled and worthy to contain the person of the God-Man and to collaborate with Him. Therefore God pre-ordained her before all ages, chose her from among all that had ever lived, and deemed her worthy of more grace than anyone else, making her the holiest of saints, even before her mysterious childbearing. For that reason, He graciously willed that she should make her home in the Holy of Holies, and accepted her as His companion to share His dwelling from her childhood. He did not simply choose her from the masses, but from the elect of all time, who were admired and renowned for their piety and wisdom, and for their character, words and deeds, which pleased God and brought benefit to all. Note where this choice began. The excellent Seth was chosen from among Adam's children, because by his well-ordered conduct, his control over his senses and his glorious virtues he showed himself to be a living heaven and so came to be one of the elect, from whom the Virgin would spring forth, that truly heavenly and divinely appropriate chariot of the supercelestial God, and through whom He would call men back to eternal sonship. Therefore all Seth's stock were called "sons of God" (Gen 6:2), because it was from the race that the Son of God was to become the Son of Man. That is why the name Seth can be interpreted to mean "resurrection", or rather "a raising up from", which really refers to the Lord, who promises and gives eternal life to those who believe in Him. And how worthy a type of Christ is Seth? "Seth was born to Eve", as she herself says, "instead of Abel" (Gen. 4:25), whom Cain envied and murdered, whereas the Virgin's son, Christ, was born to the human race instead of Adam, whom the prince and father of evil killed out of envy. Seth, however, did not raise up Abel, as he was merely a prefiguration of the resurrection, whereas our Lord Jesus Christ resurrected Adam, for He is the true life and resurrection of mankind (cf. Jn. 11:25), through whom Seth's descendants were deemed worthy, in hope, of divine adoption, being called sons of God. That they were referred to as God's sons on account of this hope, is demonstrated by the first person to be so called and to inherit God's election. This was Seth's son Enos who, as Moses wrote, "was the first to hope to be called by the Lord's name" (Gen. 4:26 LXX). Do you see clearly that it was through hope that he came to be called? If the Seventy [translators of the Septuagint] say, "He was the first to hope to be called by the Lord's name", they are not at all in disagreement with the others; because Enos lived in a way that pleased God more than anyone else in his day, and was the first to receive this hope from God. He called upon this hope and was called after it. Seth was chosen from God from among Adam's sons, and so Luke, in preparing his genealogy, traces back to him the whole race from which Christ was born according to the flesh. Then Enos was chosen in preference to Seth's other children, as we have said. From his descendants Enoch was chosen, who proved through what happened to him that virtue does not go unrewarded, and that this fleeting world is not worthy of those who are well-pleasing to God, for he was translated because he pleased God (Gen. 5:24; Heb. 11:5). Lamech was chosen and preferred to Enoch's other descendants, and after him his son, Noah, attained to God's election and became the only father of everyone in the world after the flood. Only he and his entire family were found to live chastely at that time when the sons of God took wives from among the daughters of men, as Moses tells us (Gen. 6:1-2). This means that among the offspring of Seth, the forefather of the Mother of God, those who were rejected as unworthy were swept out of the Virgin Mother's family and completely deprived of the divine Spirit. Later this Spirit came upon the Virgin, according to the angel's words to her: "The Holy Spirit shall come upon you, and the power of the Highest shall overshadow you" (Lk. 1:35). The Spirit also arranged beforehand for the Virgin to come into being, choosing from the beginning, and cleansing, the line of her descent, accepting those who were worthy, or were to become fathers of eminent men, but utterly casting out the unworthy. This is why the Lord God said on that occasion of those rejected ones, "My Spirit shall not abide with these men, for they are flesh" (Gen. 6:3 LXX). Although the Virgin, of whom Christ was born according to the flesh, came from Adam's flesh and seed, yet, because this flesh had been cleansed in many different ways by the Holy Spirit from the start, she was descended from those who had been chosen from every generation for their excellence. Noah, too, "a just man and perfect in his generation", as the Scriptures say of him (Gen. 6:9), was found worthy of this election. Observe also that the Holy Spirit makes it clear to such as have understanding that the whole of divinely inspired Scripture was written because of the Virgin Mother of God. It relates in detail the entire line of her ancestry, which begins with Adam, then passes through Seth, Noah and Abraham, as well as David and Zerubbabel (Zorobabel), those in between them and their successors, and goes up to the time of the Virgin Mother of God. By contrast, Scripture does not touch upon some races at all, and in the case of others, it makes a start at tracing their descent, then soon abandons them, leaving them in the depths of oblivion. Above all, it commemorates those of the Mother of God's forebears who, in their own lives and the deeds wrought by them, prefigured Christ, who was to be born of the Virgin. See how Noah clearly foreshadows Him who was later to be born of the Virgin, for whose sake the election was made. For Noah was shown to be the savior, not of all the race of men in general, but of his own household, all of whom were saved through him. In the same way Christ, too, is the Savior of the race of men, not of all men in general, but of all His own household, that is of His Church; not, however, of the disobedient. Furthermore, the name Noah can be translated to mean "rest" (Gen. 5:29). But who is true "rest" except the Virgin's Son, who says, "Come unto me through repentance, all you that labor and are heavy laden with sin, and I will give you rest" (Matt. 11:28), bestowing freedom, ease and eternal life upon you. Lamech, who gave Noah this name, because he saw in him Christ, who was later to come from their stock, and would be the comfort of all God-fearing people down through the ages, clearly prophesied through this name concerning Christ. "He called his name Noah", says the Scripture, "saying, 'This name shall bring us rest from our works, and from the toils of our hands, and from the earth, which the Lord our God has cursed'" (Gen. 5:29 LXX). These words are not about the flood which came to pass, for Lamech's death preceded the flood, yet he says that Noah will "bring us rest", including himself as a partaker in the comfort he foretold. In those days it had not yet come about that in each man "every imagination of the thoughts of his heart was only evil continually" (Gen. 6:5) throughout his life, which was why universal destruction of everyone on earth came upon the earth from God. So to whom do his words refer when he says, "He will bring us rest"? He also says, "He shall bring us rest from the earth except Him who opened heaven, raised our nature thither and taught us, through words and deeds, the way up to heaven, calling us towards it? But if the flood too prefigured this rest, it did so by cutting off sins and laying them to rest, not by bringing comfort and ease to sinners. In this way and for these reasons, Noah attained to God's election. Of his children, Shem was accepted among those chosen to be the blessed family of the Mother of God. That is why, although Japheth also appears to have been well-pleasing to his father, only Shem heard from his father, "Blessed be the Lord God of Shem" (Gen. 9:26), as his progeny was to be divine. For it was from him that Abraham was descended, who was preferred according to God's election above all Shem's offspring and was called to be part of the lineage of the Virgin Mother. He was given a new name by God, and received that great promise that all the families of the earth would be blessed in his seed (Gen. 17:5; 12:3). According to Paul, Christ our God, who was born of the Virgin, is his seed according to the flesh (Gal. 3:16). And who could describe the divine visions that Abraham experienced, or the signs and promises from God which foreshadowed and prophesied concerning the ever-virgin Mother of God and her ineffable childbearing? Let us, however, quickly pass over what happened next, as time does not permit us to speak at length. From among Abraham's children Isaac was chosen, then Jacob from among his sons, and the tribe of Judah from Jacob's offspring. From this tribe the root of Jesse was selected, and for those who sprang from this root, David the psalmist and prophet and king, of whom God says, "Thy seed shall endure forever, and His throne as the sun before Me; and as the moon that is established forever, and the witness in heaven is faithful" (Ps. 89:36-37 LXX). Who is this witness? Obviously He who sits upon the heavenly throne, of whom it says elsewhere: "His name shall be continued as long as the sun: and all the families of the earth shall be blessed in Him" (Ps. 72:17 LXX). From this the lineage of the Mother of God and Joseph, to whom she was betrothed, seems somehow double, for both were of the same tribe and descent according to the law. Thus the family's ancestral line is twofold, made up both of natural children and children according to the law, often converging into one, but sometimes divided into two, so that the same child, strange as it may seem, might be the son of two fathers who are brothers, of the one from a legal point of view, as not having been begotten of him physically, and of the other, according to nature, as having been raised up as seed for his brother (Matt. 22:24; Deut. 25:5; Gen. 38:8); inasmuch as the child traces his ancestry back to David through both his fathers. It is possible to see the dual nature of this lineage in another respect, because the royal line was united on many occasions and in numerous ways with the priestly one. Thus in the holy ancestral line of the Mother of God, Zerubbabel traces his lineage back to David through the descendants of Nathan, who was counted among the priests, as well as through those of Solomon, who inherited the kingdom. For this reason the Lord's genealogy according to the flesh is drawn up differently by the evangelists Luke and Matthew, because one takes into account natural fathers, the other, fathers according to the law, and one mentions only those of royal descent, whereas Luke brings in those of the Levitical race and those of the royal house, who were bound together by priesthood or marriage. As for Zerubbabel, because he was also favored among the Mother of God's forbears, he too prefigured Christ and was honored with great titles and authority. Born in captivity, he was admired by Cyrus, king of the Medes and Persians, for his virtue and understanding. He taught both Hebrews and foreigners the power of the truth, set his race free from servitude, and restored God's Temple (1 Esd. 4:33-63; Ezra 3:1-13). Later Christ did something similar, not renewing the inanimate Temple, but that living, rational temple, our nature, and redeeming it, not from perceptible and temporary, but spiritual and primeval captivity. Nor did He move His followers from one country to another, but transferred them from earth to heaven. Zerubbabel was the forefather of both the Virgin and Joseph to whom she was betrothed, but whereas she was the Virgin's forbear by nature alone, he was Joseph's according to nature and the law. For Joseph had two fathers, Heli according to Luke (Lk. 3:23), and Jacob according to Matthew (Matt. 1:16). Heli and Jacob were brothers descended from Zerubbabel, and when Heli died without children, Jacob fathered a child, Joseph, by his brother's wife, who according to the law belongs to Heli. Now these things are examples and types of greater mysteries, since it was necessary that the royal line be united in many ways, with the priestly race, which would bring forth the family of Christ according to the flesh; because in many ways Christ is truly the eternal King and High Priest. And the fact that adopted sons are counted as sons, that the law approves of adoptive fathers no less and sometimes more than natural fathers, and that the same, appropriately, applies to other kinds of kinship, was a clear example and type of our adoption by Christ, our kinship with Him and our calling according to the Spirit and the law of grace. For the Lord Himself says in the Gospels, "Whosoevr shall do the will of My Father which is in heaven, the same is My brother, and sister, and mother" (Matt. 12:50). Do you see that the family and kin of Christ are not engendered according to nature, but according to grace and the law that comes from grace? This law is so far superior to the law given through Moses that, whereas those called sons according to the law of Moses are neither born of God nor do they transcend human nature, those styled sons by the law of grace are born of God, brought to perfection above nature and made sons of Abraham through Christ, more closely associated with Him than sons according to blood. All who have been baptized into Christ have put on Christ, according to Paul (Gal. 3:27), and although they are other people's children according to nature, they are born supernaturally of Christ, who in this way conquers nature. For as He became incarnate without seed of the Holy Spirit and the ever-virgin Mary, so He grants potential and power to those that believe in His name to become children of God. For "as many as received Him", says the evangelist, "to them gave He power to become the sons of God, even to them that believe on His name: which were born, not of blood, nor of the will of the flesh, nor of the will of man, but of God" (Jn. 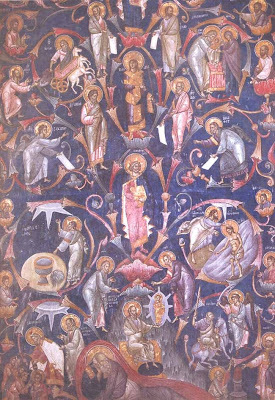 1:12-13). Why, when he says, "which were born of God", does he not say "and became sons of God", but "received power to become" sons? Because he was looking towards the end and universal restoration, the perfection of the age to come. The same evangelist says in his Epistles, "It does not yet appear what we shall be: but when He shall appear, we shall be like Him" (1Jn. 3:2). Then we shall be children of God, seeing and experiencing God's radiance, with the rays of Christ's glory shining around us and shining ourselves, as Moses and Elijah proved to us when they appeared with Him in glory on Mount Tabor (Matt. 17:3; Lk. 9:30). " The righteous", it says, "shall shine forth as the sun in the kingdom of their Father" (Matt. 13:43). We receive power for this purpose now through the grace of divine baptism. Just as a newborn infant has received potential from his parents to become a man and heir to their house and fortune, but does not yet possess that inheritance because he is a minor, nor will he receive it if he dies coming of age, so a person born again in the Spirit through Christian baptism has received power to become a son and heir of God, a joint-heir with Christ (Rom. 8:17), and in the age to come he will, with all certainty, receive the divine and immortal adoption as a son, which will not be taken from him, unless he has forfeited this by spiritual death. Sin is spiritual death, and whereas physical death is annulled when the future age arrives, spiritual death is confirmed for those who bring it with them from here. Everyone who has been baptized, if he is to obtain the eternal blessedness and salvation for which he hopes, should live free from all sin. Peter and Paul, the leaders of the highest company of the holy apostles made this clear. Paul said of Christ, "In that he died, he died unto sin once: but in that he lives, he lives unto God", (Rom. 6:10-11), whereas Peter wrote, "Forasmuch as Christ has died for us in the flesh, arm yourselves likewise with the same mind: that you no longer should live the rest of your time by the lusts of men, but by the will of God" (1 Pet. 4:1-2). If it was for our sake that the Lord lived His time on earth, to leave us an example, and He passed His life without sin, we too must live without sin, in imitation of Him. Since He said even to Abraham's descendants according to the flesh, "If you were Abraham's children, you would do the works of Abraham" (Jn. 8:39), how much more will He say to us who have no physical kinship with Him, "If you were My children, you would do My works"? It is therefore consistent and just that anyone who, after divine baptism, after the covenants he made then to God and the grace he received from it, does not follow Christ's way of life step by step, but transgresses and offends against the benefactor, should be utterly deprived of divine adoption and the eternal inheritance. From On The Saints: Sermons By Saint Gregory Palamas, Mount Thabor Publishing, "On the Old Testament Saints".